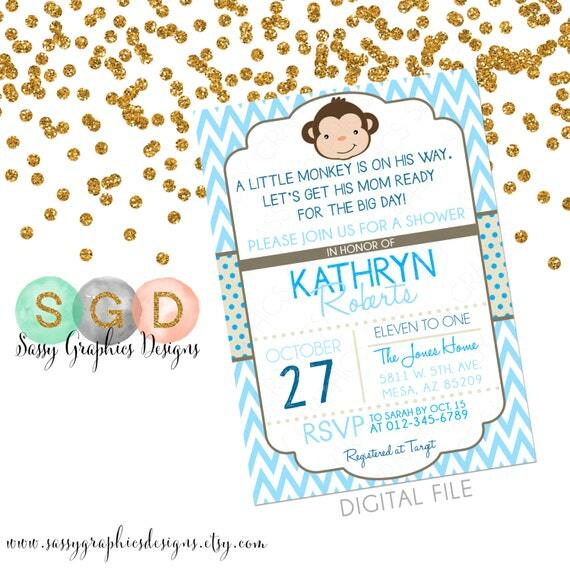 Delight your guest with this cute monkey baby shower invitation. The baby blue chevron with tan and navy blue accents and monkey artwork design make this the perfect invite to welcome a new baby boy. It will make your baby shower a very special occasion indeed. The DIY invitation spans across a cute and trendy style baby shower theme. With fun items like monkey cupcake toppers and water bottle wrappers, you can rest assured your event will be memorable. This printable invitation will set the scene beautifully and your guests will really look forward to the day. important information regarding your order. *** Awesome! Best service ever! Very friendly and helpful. Will always use for invites from now on! *** The design was perfect. Color was great and you can't beat the price. ***Excellent customer service. Incredibly fast turnaround time. The print looks just as beautiful as it did online. A pleasure to work with! Will use in the future. Many thanks! !